Corcoran and Hardy take their first title!! Over the weekend the BTC Men’s Handicap Doubles Championship was won by Ian Corcoran and Brenton Hardy off 65. They beat young fellas Patrick Johnson and Paul Hallet off 66 in the final 8-5. The word on the street was that the young guys were finishing fast but Ian, particularly, was steady enough to get the job done. Both pairs are relatively new members at BTC, so that’s a good sign. 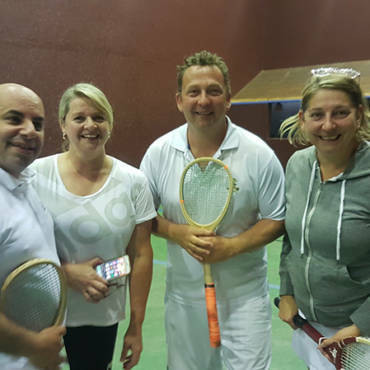 Semi finalists who fell to the long handicappers were Will Hoskin teamed with Paul Williams who had to give Rec 30, Owe 15 one serve, ban tambour and 3 and 4 chases each. Starting well Paul and Will led 3-0 and 4-1 but succumbed 8/5 to Johnson and Hallet. The other semi saw less than pristine Stuart Strange and Rob Jolly defeated by Corcoran and Hardy again 8/5. This handicap was Rec 30, Owe 30 ban tambour and one serve. Again, the more experienced players got out of the gates well to reach 4-all, but could not sustain the winning ways and lost 8/5.